Live palm trees and frangipanis in blossom seem to grow straight out of the water at this luxury resort. Each tree has its own private square of island in the scallop-shaped pool. 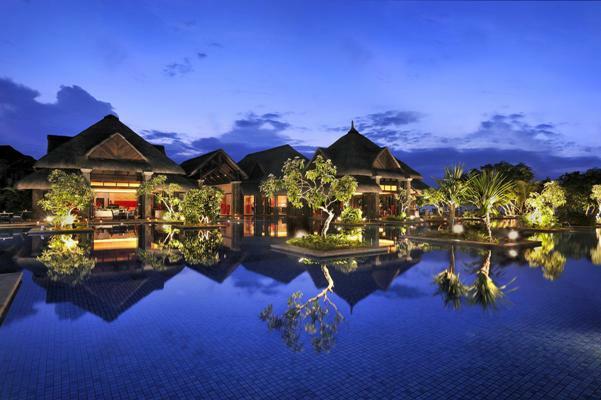 The pool falls to infinity and the beachfront on one side and laps at the thatch roofed hotel bures on the other. The hotel look like an exotic island village, with five stars of course. Small terraced waterfalls step down from the lobby towards the beach. The hotel on Turtle Bay is part of Starwood hotels special Luxury Collection. See it live on webcam at www.roomwithaview.com.